If you're a serious reader of Raydium's forum or our SVN feed, you've probably seen the amazing work-in-progress of st, our Mac guy. And he did it ! MacOS X is now an official target for Raydium ! This was requested by many developers and users since years. So you can now expect to see Raydium games for MacOS X, starting with the upcoming st's port of ManiaDrive. Of course, all our next games will also support natively this target at release time, including ManiaDrive 2 (aka ManiaCrash) ! You can have a look to the forum thead about this new Raydium port, and report your experience with this brand new SDK. - Xcode 2.4 or higher. - Latest Raydium Subversion revision R709. - Universal binary dependencies for all kinds of i386 and PPC architecture subtypes. - Xcode 2.4 compatible project files. - iCompile script to easily build and test applications using a terminal. - Application template including the Leopard ready IconsFileStore Raydium logo. 1. 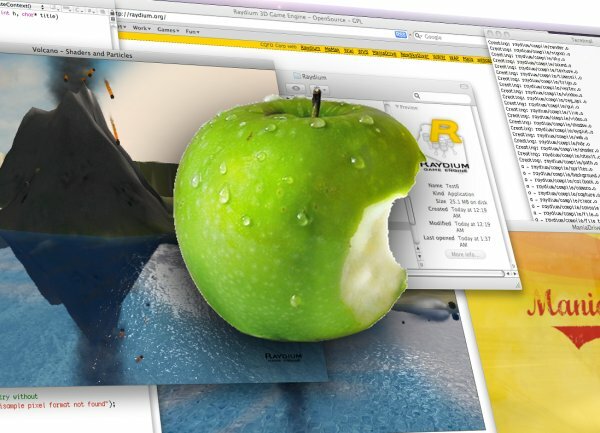 Download the Raydium SDK for Mac OS X. 2. When the auto-mount option was disabled, double-click the disk image to mount it. 3. Drag & drop the Raydium folder wherever you like to install the SDK (e. g. /Library/Raydium or ~/Library/Raydium). 4. Start up Xcode and load the Raydium.xcodeproj or open a terminal and use the iCompile script to build the samples. Thank you for the conclusive news entry with its expressive picture. I also like the new engine quick downloads in the download section. Last edited by st on Wed Feb 15, 2012 6:46 pm, edited 1 time in total. I've updated win32 sdk to have same vers as macos. I removed ide, as codeblock is now very easy to install with mingwin. We don't have to package a consistent package. Perhaps you can put quick download on the top of the page ? If I may, having code::blocks directly in the SDK was quiet a good idea, allowing to directly code without downloading everything else than the SDK itself. Since windows does not provides any IDE/compilo out of the box, the current win32 SDK is very helpful for newcomers: download, unzip, launch "codeblocks.bat" and code. Having two SDK, one with the IDE, and the lightweight other without, could be a great option, but requires two package: more work, more space and bandwidth, ... Not a good idea in facts. I can reintegrate codeblock in the win32sdk. Codeblock is really trivial to install now and it is already packaged with mingw. But it's not a problem for me. to win32 SDK users : hand up and tell us what do you think of all this !